Asphalt has always been and continues to be the pavement of choice across the globe. At present more than 80% of the roads around the world are surfaced with asphalt which requires maintenance and refurbishment at regular intervals, hence augmenting the need for asphalt pavers across the globe especially in developing countries. Developing countries such as China, India and Brazil have invested huge amounts in developing the paved road networks in their countries, which has significantly augmented the demand for asphalt paver equipment in these countries. Moreover, developed countries are also spending huge amount on maintenance and construction of new roads to extend their paved road networks in remote and rural areas. For instance, Bulgaria and Poland has witnessed the major growth in expenditure over road investment programmes co-financed in these countries through EU Cohesion and Structural funds since their accession to the European Union. 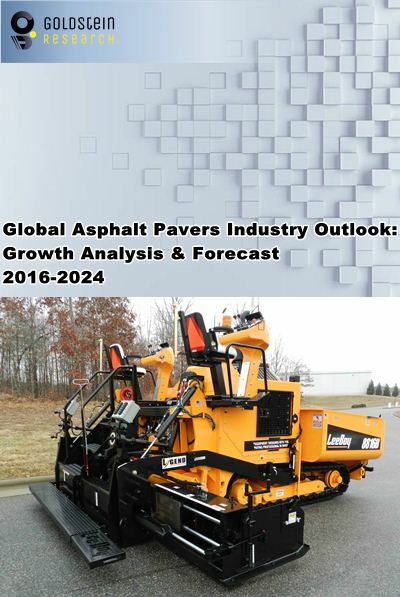 Goldstein Research analyst forecast the global asphalt paver market to expand at a CAGR of 4.2% during the forecast period 2016-2024. The demand for asphalt paver market is likely to grow at faster pace in developing countries owing to growing expenditures over road networks, expansion of highways and upcoming infrastructure projects which have fuelled growth of the asphalt paver market. The report covers the present ground scenario and the future growth prospects of the asphalt paver market for 2016-2024 along with the total revenue of asphalt paver market in every region. We calculated the market size and revenue share on the basis of revenue generated per segment, regional and country level. The revenue forecast is given on the basis of number of asphalt paver manufacturers and current growth rate of the market. Based on product type, tracked pavers accounted for highest volume share around the globe in 2016, with hydrostatic technology being the primary choice of contractors. Moreover, the tracked paver is further expected to grow at significant pace on account of higher power and greater stability during the forecast period. Global Asphalt paver Market Outlook 2016-2024, has been prepared based on an in-depth market analysis from industry experts. The report covers the competitive landscape and current position of major players in the global asphalt paver market. The report also includes porter’s five force model, SWOT analysis, company profiling, business strategies of market players and their business models. Global asphalt paver market report also recognizes value chain analysis to understand the cost differentiation to provide competitive advantage to the existing and new entry players. Our global asphalt paver market report comprises of the following companies as the key players in the global asphalt paver market: Ammann Group, Atlas Copco AB, Bomag GmbH, Caterpillar, Roadtech Inc., Romanelli, Volvo Construction Equipment Corporation, VT LeeBoy, Inc., Wirtgen GmbH and Dynapac. According to our global asphalt paver market study on the basis of extensive primary and secondary research, one major trend in the market is rental and reuse of asphalt pavers. Most of the contractors prefer to use rental asphalt paver in order to avoid the maintenance costs, this trend is prevailing in the asphalt pavers market but also restraining the new equipment sales for major players in this market. According to the report, major driver in global asphalt paver market is the growing network paved road networks across the globe. The developing regions are introducing projects and spending huge amount to extend their road networks in order to support the growing economy of their countries. Further, the report states that one challenge in global asphalt paver market is attracting and keeping skilled employees. The road construction contractor’s major concern is workforce education and continuing training as the industry is evolving at rapid pace with advanced technology options that result in higher paving quality and increased productivity. However, these technologies cannot be implemented without proper training of workforce. Geographically, Asia Pacific region accounted for the largest market share of 31% revenue in global asphalt paver market. North America is closely followed by the Asia pacific region, which occupied about 28% of the market share owing to presence of largest road network of U.S which accounts for more than 4.2 million Km paved road network. Developing countries such as Brazil, Russia and South Africa have immense potential for the market growth attributed to rapid urbanization and govt. expenditures over infrastructure development.